GiegerCars has a love affair with American cars, and a particularly strange affection for Hummers. The German tuner has created all sorts of strange variants like a Christmas-themed H2, a 700-horsepower H2 built for a Texas sheriff or any number of racing-liveried Hummers like the "Gulf Wing" or this Martini Racing inspired H3. 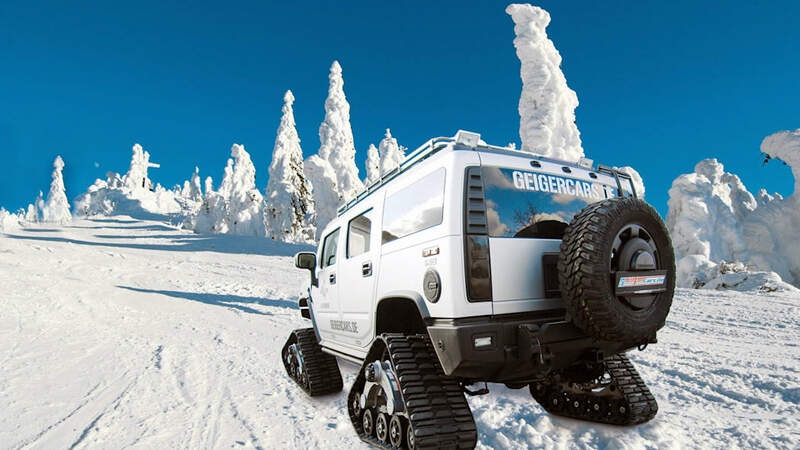 GiegerCars' latest creation is the Hummer H2 Bomber. 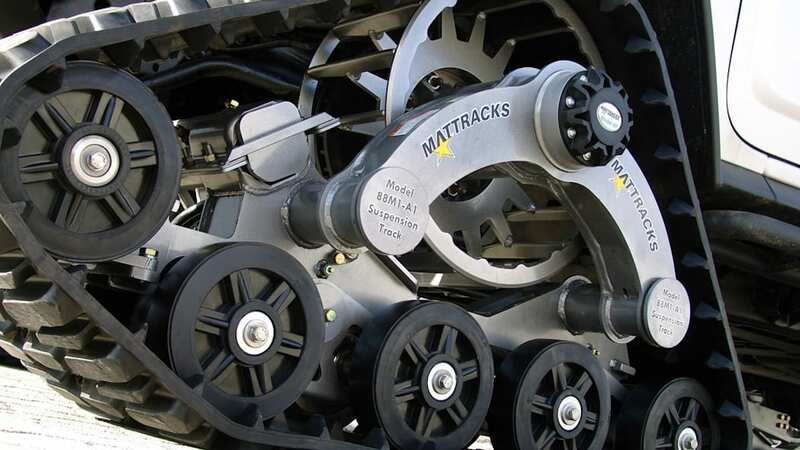 The most notable modification is the addition of four Mattracks 88M1-A1 rubber tracks that replace the twenty inch wheels. The rest of the vehicle features a military design theme as well as a roof box with lighting and a silver matte paint finish. Now all we need is a race on a snow-covered drag strip between this and Ken Block's Subaru TRAX STI. Follow the jump for the press release from GeigerCars. In its regular trim, the Hummer H2 not only looks fantastic, but also brings with it a real degree of off-road capabilities. 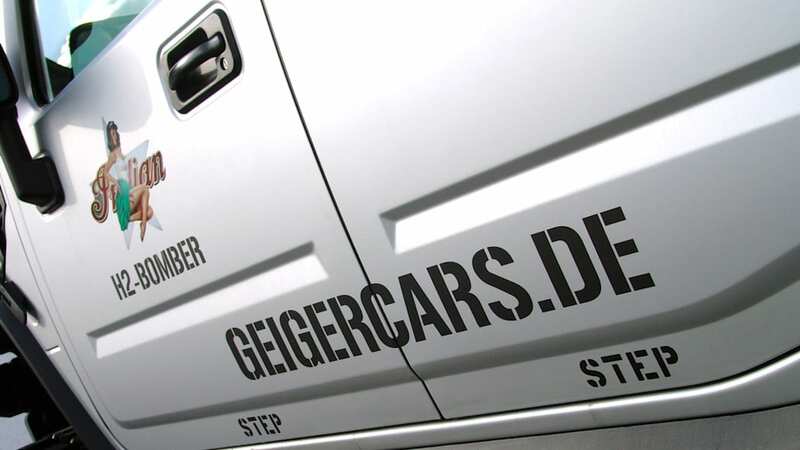 But this can go much further, as GeigerCars.de have proved with the "H2 Bomber" on rubber tracks. In contrast to the regular wheels with their 8.5" x 20" rims encompassing 305/60 tyres, the specialists from Munich have equipped their project SUV with a Mattracks 88M1-A1 rubber tracks at each wheel. 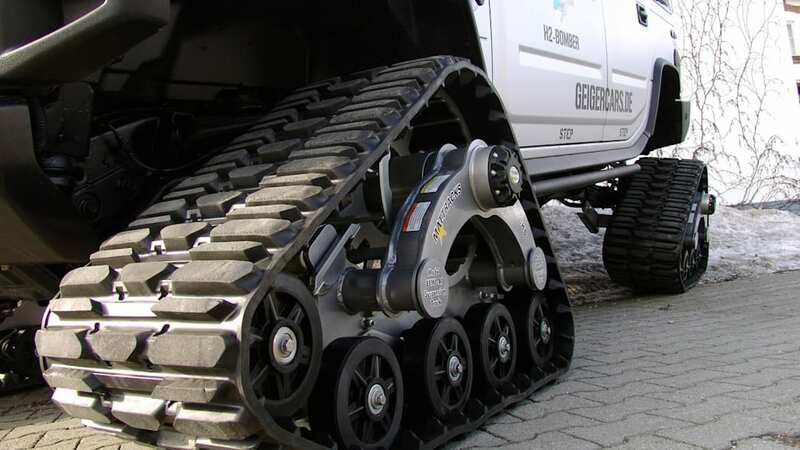 Those massive structures, 40cm wide and 150cm long, guarantee unrivalled traction on virtually any type of terrain, whether the vehicle is needed for agriculture, emergency services or expedition. Even extreme gradients are handled without a sweat, not least thanks to the powerful 8 cylinders under the bonnet which gives you 398 bhp and 574 Nm of torque. 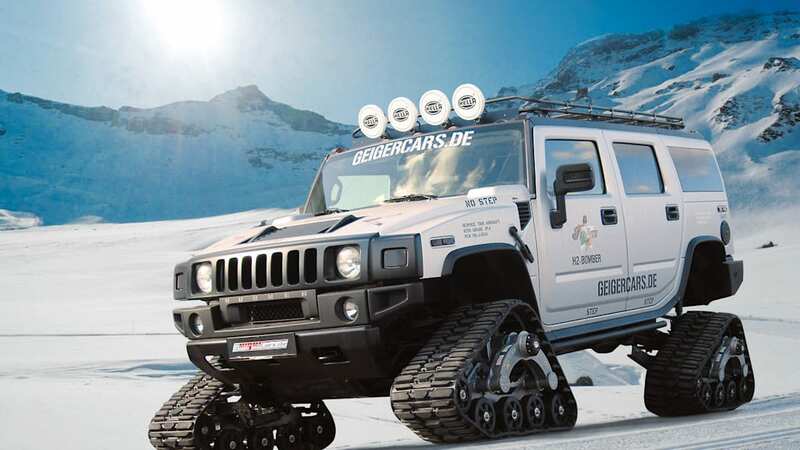 How well the GeigerCars.de Hummer acquits itself on the rubber tracks can be left to Autobild editor Wolfgang Blaube to experience: He explored to legendary Nordschleife of the Nürburgring in the depths of winter with the circuit covered in snow and was completely captured by the "new dimension of fun" after just a few kilometres. Also in the interior of the GeigerCars.de "Bomber", finished in a matte silver, with extra headlights on the roof and the lettering printed in an army style, the fun factor is not missed out: The luxury design fulfils every wish and a sunroof is every bit a part of the Hummer project as the navigation system with a DVD drive from Kenwood, the roof monitor with headphones or the rear-view camera including a monitor in the rear-view mirror. 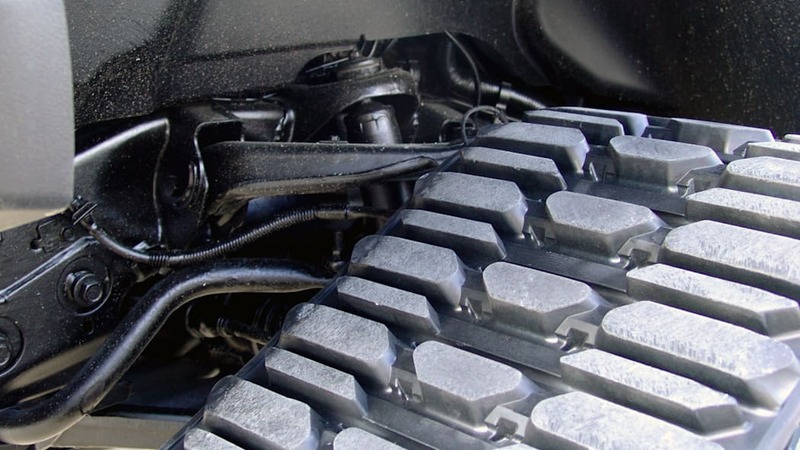 If requested, the Geigercars team can of course equip each Hummer model with an economical LPG autogas system and other extras. If you're on the lookout for an off-road master, the H2 is definitely the right choice. 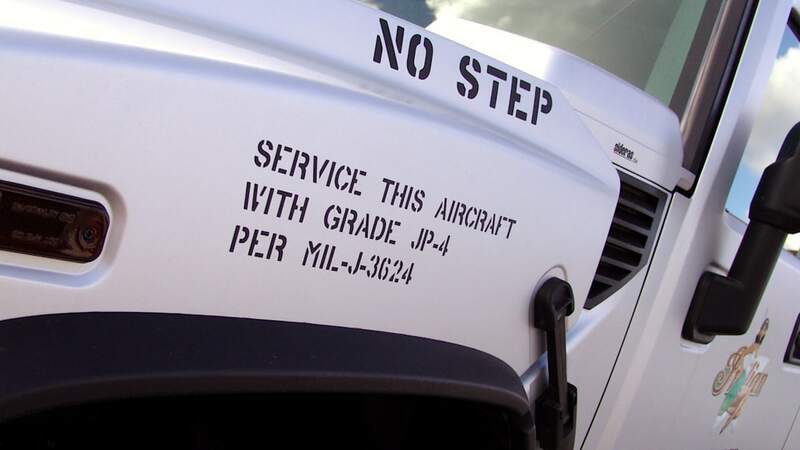 With a Hummer equipped with rubber tracks, no terrain remains inaccessible.